From 2011 I am managing and working on a project with Acantho S.p.a and Softech (University of Modena and Reggio Emilia) that focuses on Video Surveillance as a Service, known also as VSaaS. VSaaS is turning upside-down the trend that video surveillance has been chasing in the last 10/15 years, i.e. having smart cameras able to perform video analytics on site and dispatch to the end users just meta-data and eventually some video data upon event-trigger or request. 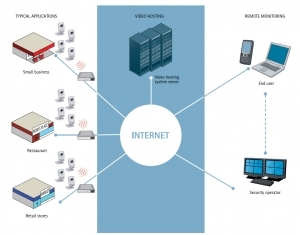 VSaaS instead introduces the new element of the service provider (a datacenter) devoted to the tasks of Digital Video Recorder and video analytic server, leaving on the back-end just the (IP) camera, the electric plug and the network cable, and on the front-ent just the web browser of the user. Axis provides this nice depiction of VSaaS. The VSaaS is typically offered with the business model of services (e.g. a small monthly cost), and not of end-user products. Of course this paradigm makes sense when the network bandwidth can support the heavy streams of video data (let’s also considert that Megapixel cameras are becoming increasingly common), as in the case of Acantho’s customers, since this company provides fiber optics network connectivity. The Video Management Software that supports VSaaS on datacenters can be a commercial one (e.g. Milestone XProtect or Genetec Omnicast), or related to specific hardware manifacturers (e.g. Axis AVHS) or even open source (e.g. ZoneMinder). Each choice has pros and cons. That is what we are investigating with Acantho.